The endangered species "Purple Grass (Murasaki)" in Higashi Omi-shi is a plant cultivated in the Higashi Omi area since the Manyoha era about 1400 years ago, and the root part "Shikon" Because it is purple in color, it is named "Purple Grass". In addition to being used as a dye of "Dark purple (Kokumarasuki)" of the "highest rank of the crown and the highest ranking of the crown position", purplegra has been called "Boraginol" in German, It is also included in the Japanese pharmacopoeia as a medicine for wound medicine, it is the only plant in Japan designated as "city flower", Higashiomi city. However, due to the change of the environment caused by the purple plant, global warming, the cultivation is extremely difficult, and as the endangered species registered in the Ministry of the Environment's Red Data List, the death rate of violet grass in Higashiomi City There are also years exceeding 95%. However, in this Oku Eigen-ji area, this "purple plant" grows, and its "flower" is blooming as a symbol of regional activation, because it has a cool climate with an altitude of 400 m or more. The area around Funaoka, which went north of Omi Railway City Station in Higashi Omi City, has long been called Gamano (anymore) and was the habitat of the court. There is a record that Emperor Tenshi visited here for the game in the year 668 AD, and "Representative love song of Millionaire", "The King of the Rings" "A singing song of" Emperor Ohno Mamiko (Ooha Mamoniko: Emperor Tenzo, later Emperor Tenmu) "was heard in this place. At the time, the amount of money wielding the warrior that wielded the sleeve, which was a sign of courting love, can be seen in the wild guard (keeper of the field), ⽥王 the Great Palace Princess could hate you If you do not fall in love with a married woman, I will return a song that recounts a violent love affair. After the hunting in which the songs were recited, Emperor Tenchi Nakao Emperor recommended the "Emperor Hiroshi Otomo", his own breath to the next Emperor during his succession to the throne To do. However, the householders and the public opinion, not the young empress Otomi, but the younger brother 's Prince Oohama was promoted. Therefore, in this state, the Prince Omihi, afraid of being a royal battle, will shave and leave for Nara. However, just after Emperor Tenzo passed away and a funeral ceremony was held, the family begins to persuade Prince Seven and the soldiers gather in Nara. In such a tide, the Seven Seas' Principality is carried up, decides in a bad way and brings up a war, but in reality this is the biggest "乱 乱 の 乱" in the first battle of ancient Japan. In the end of nearly a year the rioting turbulence ended, Otsu Kyoto that had the capital at that time, Omi's "Battle of Setosekawa river" settled, the Imperial Court Army with Emperor Otomo lost. The Rebel Army, the battalion of the Great Palace, victorious, Okami has renamed his name "Emperor Tenmu". And the Emperor Tenmu decided that "Taikyo Ruler" which is the first law in Japan, and among the items "Banned" in it, it was decided to make deep purple the most noble color is. 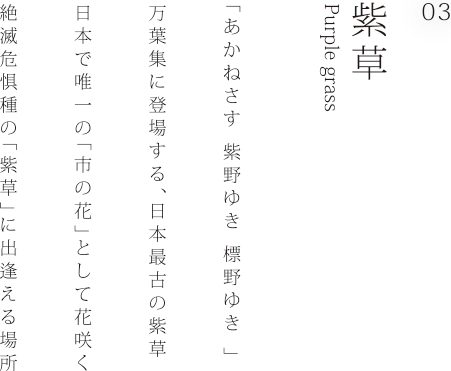 I declared that "Romanticus of Purple Grass" that I compiled with my beloved "Futoshi Ogata" as "prohibited" at the Akatsuki who became Emperor Tenmu, restricting the ransom noisy. The message of Romantic and Purple of Love in Japan's country color, "Dense purple", is still living in Higashiomi City. Why do not you enjoy the "Manyo-le Romant's Purple Story" together with us?